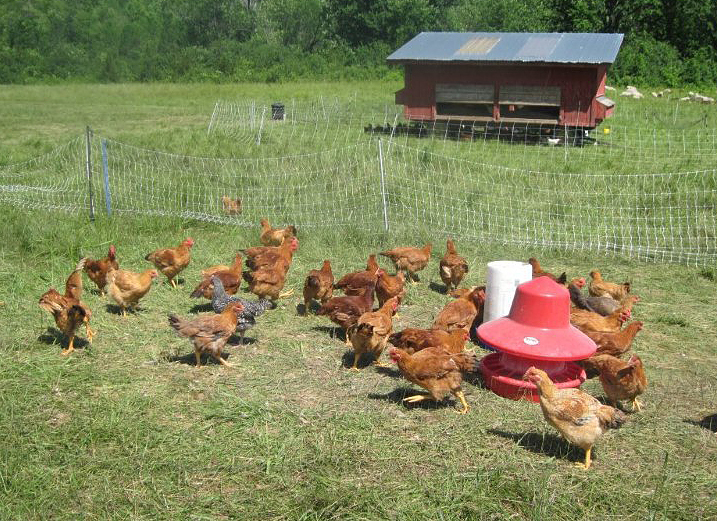 All of our chickens are raised in small groups, outdoors in portable, open bottomed pens which are moved daily to fresh pasture. They are clean, healthy and have constant access to grass, grit, bugs, sunshine and fresh air. In addition to what the birds forage themselves, we feed a premium ration of non-GMO grain from Conway Feed, our neighborhood, family-owned mill. This healthy, natural diet and lifestyle result in firm, yet tender meat, with a wonderful flavor that simply cannot be found in broilers raised in the industrial model. Chickens are sold exclusively by pre-order. Follow the link below for details.